4 Digital Inputs for External equipment failure monitoring. 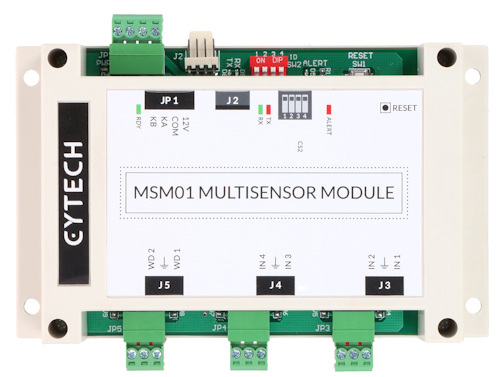 The MSM01 provides the sensor values and External Input events to CM9001-EMS Environmental Monitoring System. CM9001-EMS can be set up to trigger alarms, dial out and and send SMS messages to programmed telephones. Map the Internal Temperature Sensor value to a CM9001 Sensor Register. Select a Sensor Register 0 to 31. The CM9001 Sensor register will be constantly updated with the internal Temperature in degrees Celsius. In the default template, the Temperature is mapped to Sensor 1 named “Sens01-Temp1”. Temp Sensor Change Report This is the minimum change in temperature value before a new value is reported by MSM01 to CM9001. For example a value of 1 means that any change of value >1 will be reported to CM9001. This is to reduce the number of reports to CM9001 if the number of changes is expected to be high. Set to 0 to report any change of value. 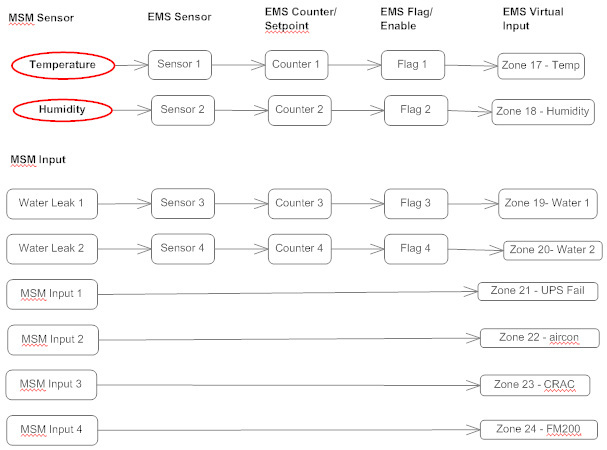 Map the Internal Humidity Sensor value to a CM9001 Sensor Register. Select a Sensor Register 0 to 31. The CM9001 Sensor register will be constantly updated with the internal Humidity in % RH. In the default template, the Humidity is mapped to Sensor 2 named “Sens02-Humid1”. This is the minimum change in humidity value before a new value is reported by MSM01 to CM9001. For example a value of 1 means that any change of value >1 will be reported to CM9001. This is to reduce the number of reports to CM9001 if the number of changes is expected to be high. Set to 0 to report any change of value. 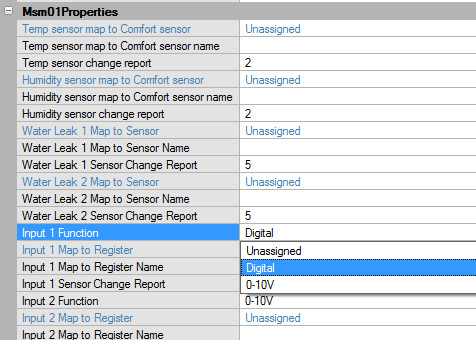 This applies to Water Leak Inputs 1 and 2.Map the Water Leakage Sensor value to a CM9001 Sensor Register. Select a Sensor Register 0 to 31. The CM9001 Sensor register will be constantly updated with the Water Leakage sensor value. In the default template, Water Leak Input 1 is mapped to Sensor 3 named “Sens03-Water1, and Water Leak Input 2 is mapped to Sensor 4 named “Sens04-Water2”. This is the minimum change in sensor value before a new value is reported by MSM01 to CM9001. For example a value of 1 means that any change of value >1 will be reported to CM9001. This is to reduce the number of reports to CM9001 if the number of changes is expected to be high. Set to 0 to report any change of value. Digital Input means the Input is a Normally Open voltage-free contact, . This is used to connect external inputs from equipment to indicate some failure or Fault. The Digital Input is mapped to a CM9001 Zone 1 to 96 as virtual Input. For Digital Input, select a CM9001 Zone/Input as Virtual Input. A Virtual Input is like a Physical Input on CM9001 – it has Zone Type Properties, and triggers an Alarm Type which has up to 16 phone numbers assigned for dial out. Virtual Inputs are a powerful mechanism for activating Alarms based on sensors values. A Zone/Input that is assigned as a Virtual Input will ignore its physical input terminal. When checked the real time values of the assigned sensors and Input registers can be seen, as shown in the screenshot below. The flowchart below graphicallly summarises the settings provided by the defmsm.cctx file. Note that the settings can be changed as required.